This evening we dip into 2 Kings and make some interesting discoveries about Elijah and Elisha. There are some clear hints of Jesus in these chapters. Sean and I hadn't met for several weeks so it was good to spend the evening together again. Instead of a time of prayer and listening, this time we thought it would be good to dip into the Bible for a while. Sean has been working his way through 2 Kings recently, and we mostly focussed on chapters 3, 4 and 5. Before he was caught up into heaven, Elijah asked Elisha if there was anything he could do for him. And Elisha asked for a double helping of Elijah's spirit (2 Kings 2:9). Sean wondered why he'd made this request because it had been hard enough for Elijah with just a single portion! It's a good question and I don't have an answer. We wondered about the names Elijah and Elisha, it seems clear that 'jah' is the shortened form of Yahweh (the Almighty's name), and 'Eli' is the short form of Elohim meaning 'Mighty One' or 'Almighty'. It turns out that Elijah does indeed mean 'Yahweh is my Elohim' or 'Yahweh is my Mighty One' (or 'Yahweh is my God' in traditional language). And Elisha means 'Elohim saves'. This is similar to the names Joshua or Yeshua (Jesus) which mean 'Yahweh saves'. Joshua led the people of Israel into the promised land. And Jesus leads his people into the Kingdom of Heaven. So in a sense, Elisha is like Jesus. But we already know that Jesus spoke of John the Baptist as being Elijah. So Elijah and Elisha are like John the Baptist and Jesus. This idea is confirmed by the miracles Elisha did. 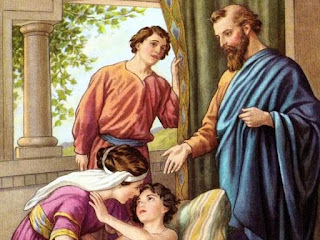 He raised the widow's son, he fed many people with a few loaves of barley bread, he healed Naaman of leprosy. And when Jesus was transfigured on the mountain he talked with Moses and Elijah. In a sense he took Elisha's part, the part of one with a greater share of the Spirit than Elijah. I don't feel I have understood these topics fully. Far from it! But we got far enough to know that these are very important chapters and there may be some fundamental truth to be unearthed. This is one to have another look at when I have more time.